Have I made marshmallow paint? Yes. Yes, I have. 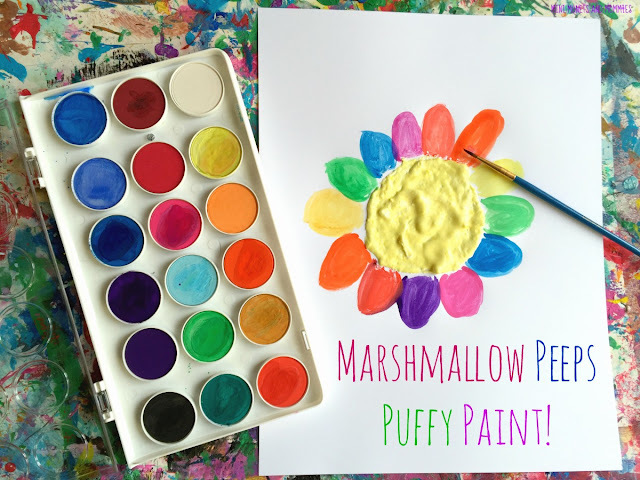 But, it’s almost Easter – so, I’m taking it up a notch and making finger paint with marshmallow Peeps. This kids’ art activity is completely simple, but messier than you’re probably imagine. 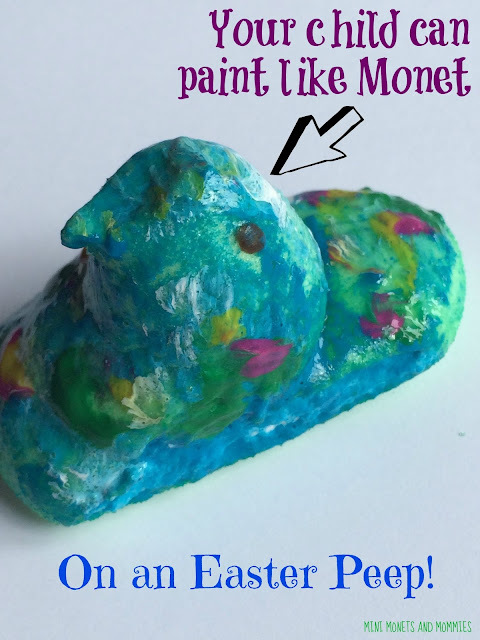 As if puffy paint (or finger paint) wasn’t messy enough on its own, add in the Peeps factor and you’ve got quite the sticky surprise. So, why try it? Well, because it’s super-fun! Even though it’s ooey, gooey and sticky, it’s also washable. 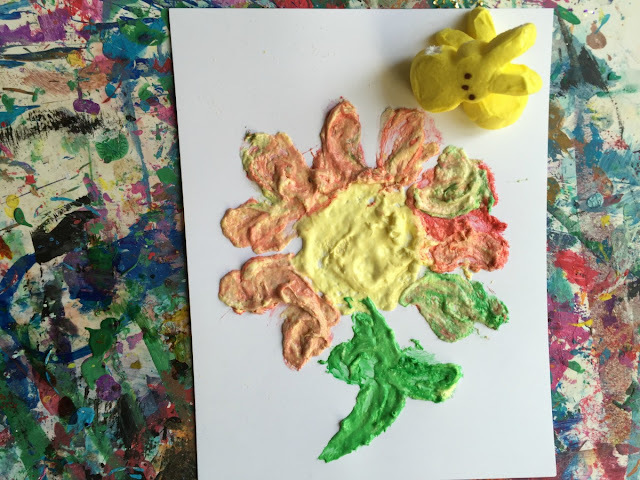 With that in mind, this Easter art activity is also a sensory exploration. 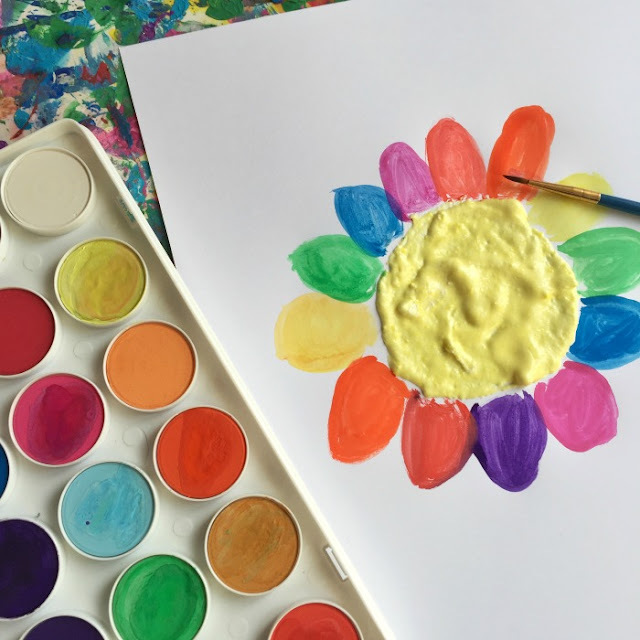 Let your little artist make a mess, get into the paint and experiment with the finger painting to her heart’s content (ok, so maybe not on the walls, your white couch or her sister’s hair). Along with the puffy paint, I’ve also added in an extra step with water colors. This is completely optional, but does offer your child the chance to continue on with the art-making in a different way. She can switch from pushing, stretching and pressing the finger paint on to the paper to holding the thin paintbrush. It’s fine motor fun! 1. 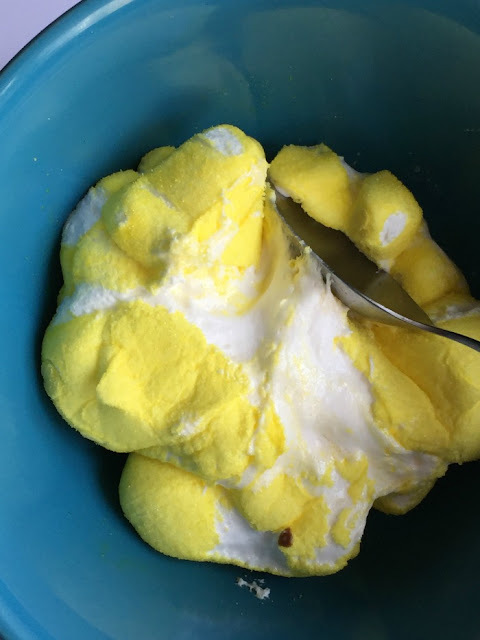 Put the Peeps into a bowl and microwave them. We used five marshmallow bunnies, and microwaved them for 20 seconds. Microwaves vary in intensity, so you may need slightly more or less time to heat them. When the marshmallow treats start puffing out, they’re ready. 2. Mix the margarine in with the marshmallows. We used one tablespoon per the five bunnies. 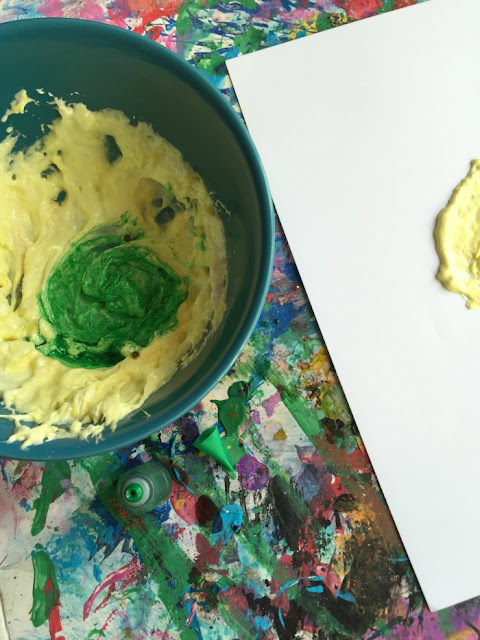 The margarine makes the paint slightly less sticky and easier to spread. 3. Test the paint to make sure it’s not too hot for your child. If it’s cool enough to touch, your child can start spreading it over the paper. 4. Optional: Add a few drops of food coloring to change the hue. 5. Optional: Wash your child’s hands, grab a brush and add water colors to the painting. We made flowers, but your child doesn’t have to. She can make a bunny, an Easter egg, a tree, a house, a plain, a train, a cat, a dog … you get it – she can paint anything she wants. Or, she can just explore spreading the paint and make an abstract work of art. 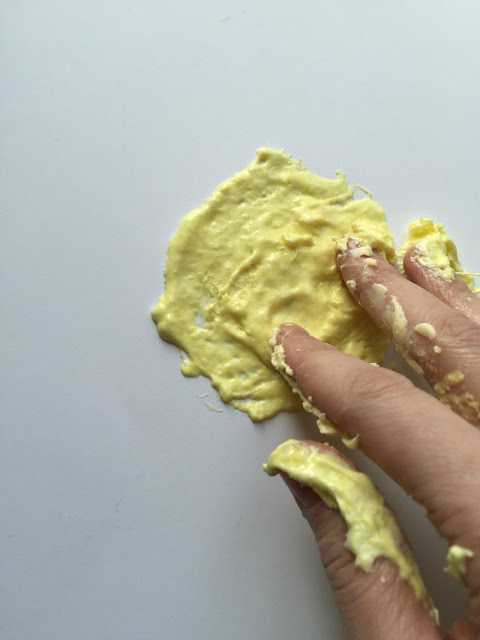 · How does the paint feel on your hands? 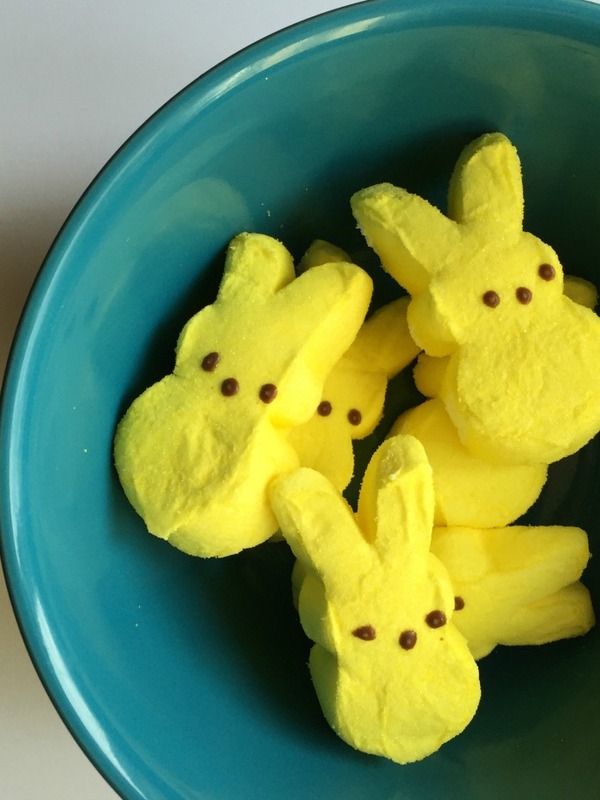 · Why do you think we needed to heat the Peeps before panting? 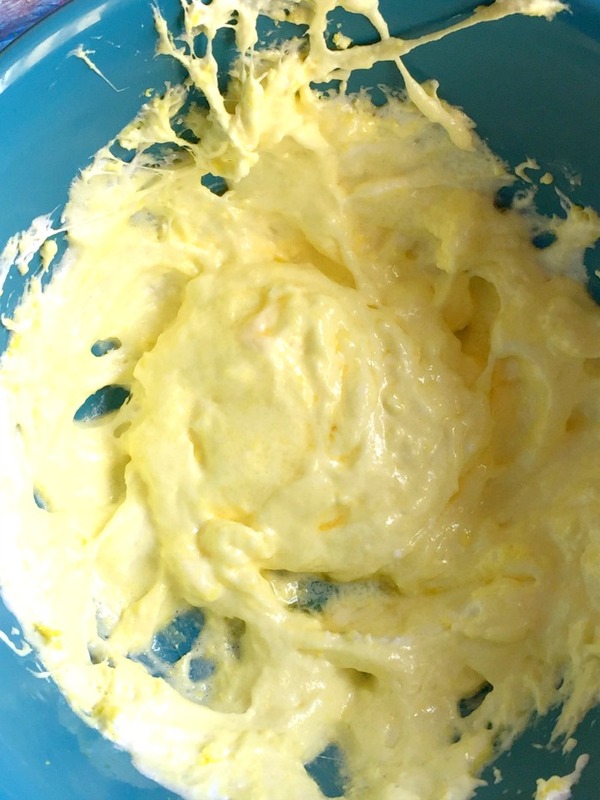 · How do you think the margarine changed the marshmallows? · What do you think will happen if we let the paint sit out overnight? – Try letting it sit out. Then touch the paint, exploring how the texture has changed. · What do you think would happen if we used a paintbrush with the puffy paint? 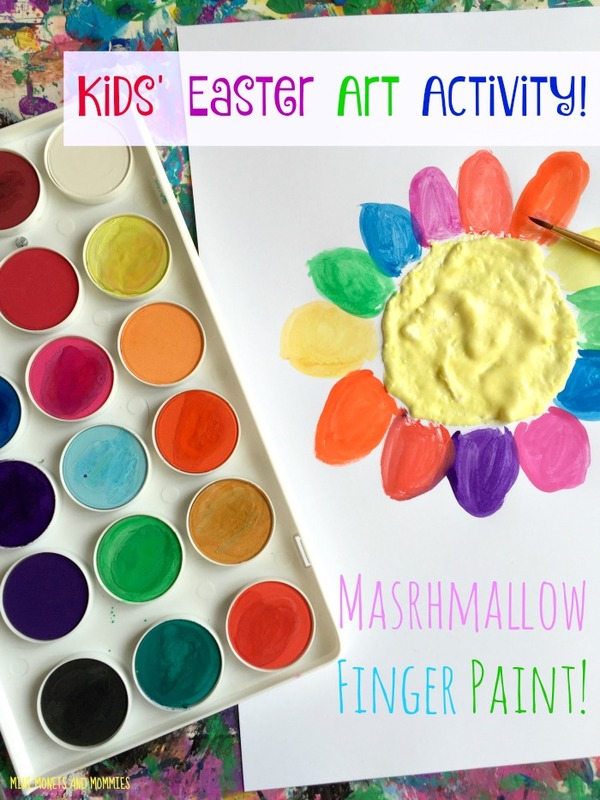 Are you looking for more Easter art activities? 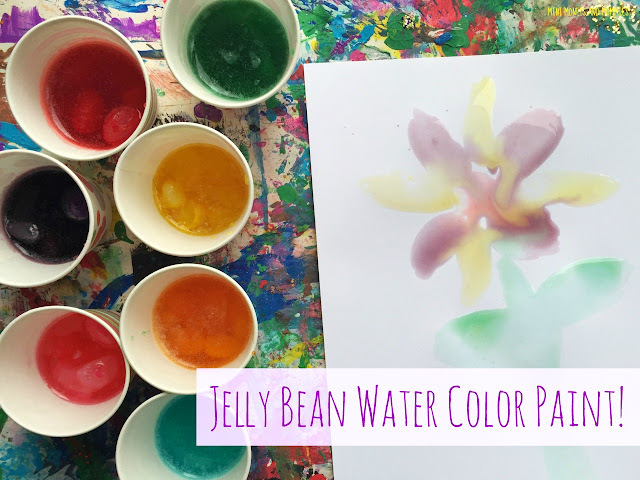 Make some jelly bean water colors! 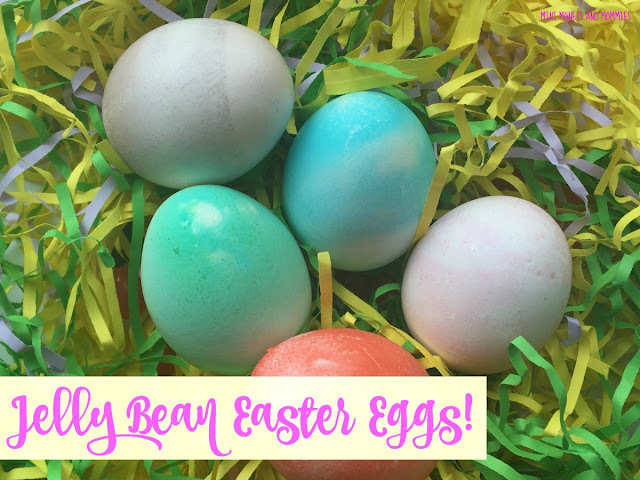 Dye Easter eggs with holiday candy! Follow our Pinterest board for ideas! This is so cute! I came over from Craftymomsshare link party. Have a lovely day! Wow - I have seen puffy paint before but never like this! Amazing. That looks sticky but probably better for your teeth to use those peeps that way!